A mosquito is a type of fly. It is the common name of a family of flies in the order Diptera. The males are nectar-feeders, and so are the females. However, in preparation for egg-laying the females turn to blood for its protein. The principal mosquito borne diseases are the viral diseases yellow fever, dengue fever and malaria carried by the genera Anopheles and Culex. Mosquitoes transmit disease to more than 700 million people annually in Africa, South America, Central America, Mexico and much of Asia with millions of resulting deaths. The oldest known mosquito with a basically modern anatomy was found in 79-million-year-old Canadian amber from the Upper Cretaceous. An older sister species with more primitive features was found in amber that is 90 to 100 million years old. Genetic analyses indicate that the Culicinae and Anophelinae clades may have diverged about 150 million years ago. The Old and New World Anopheles species are believed to have subsequently diverged about 95 million years ago. ↑ "Mosquito-Borne Diseases" – The American Mosquito Control Association. Retrieved 2008-10-14. ↑ Molavi, Afshin (2003-06-12). "Africa's malaria death toll still "outrageously high"". National Geographic. http://news.nationalgeographic.com/news/2003/06/0612_030612_malaria.html. Retrieved 2007-07-27. ↑ Singh RK, Dhiman RC, Singh SP (June 2003). 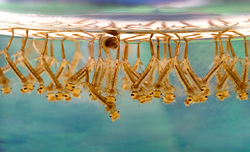 "Laboratory studies on the predatory potential of dragon-fly nymphs on mosquito larvae". J Commun Dis 35 (2): 96–101. PMID 15562955 . ↑ Marten GG, Reid JW (2007). "Cyclopoid copepods". J. Am. Mosq. Control Assoc. 23 (2 Suppl): 65–92. doi:10.2987/8756-971X(2007)23[65:CC]2.0.CO;2 . PMID 17853599 . ↑ 12.0 12.1 Calvo E, Pham VM, Marinotti O, Andersen JF, Ribeiro JM (2009). "The salivary gland transcriptome of the neotropical malaria vector Anopheles darlingi is thought to reveal accelerated evolution of genes relevant to hematophagy" (PDF). BMC Genomics 10 (1): 57. doi:10.1186/1471-2164-10-57 . http://www.biomedcentral.com/content/pdf/1471-2164-10-57.pdf. Retrieved 2009-06-21. This page was last changed on 16 April 2014, at 07:16.